On Tuesday night I went the Adelaide premiere of Josh Whedon's adaptation of Much Ado About Nothing. I was a bit nervous about going as Shakespeare tends to make me feel like a bit of a dummy - we never covered much in school, except for Macbeth. So, I wasn't sure I'd understand it but it was easy enough to follow and I really enjoyed it. I don't know what die-hard Shakespeare aficionados think but I thought it was lovely. 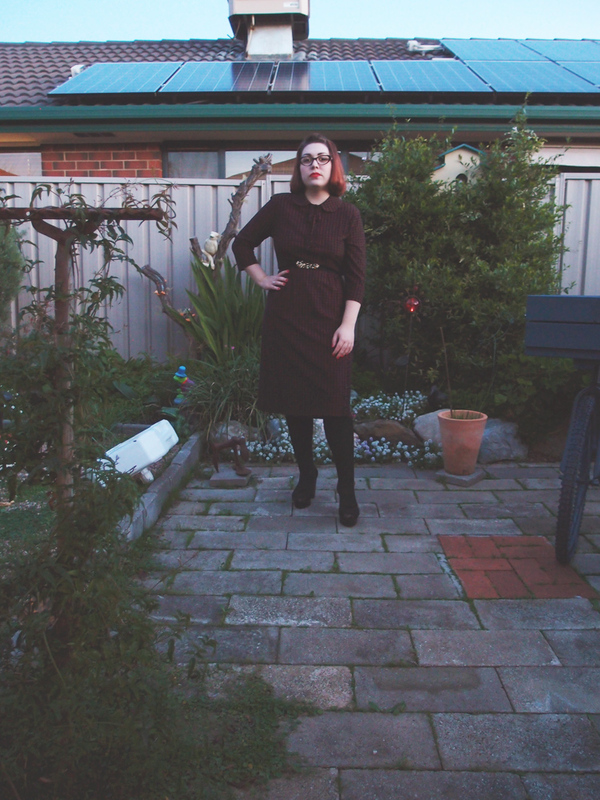 Anyway, it was a pretty chilly night so I brought out one of my few long-sleeved dresses that also happens to be comfortable enough to wear while sitting in a cinema for a couple of hours. Huzzah! While I was waiting at the cinema, I thought some people were looking over at me (you know, appreciating my awesome style) but it turns out they were ogling a Man of Steel poster. I think I can forgive them, though. Ha. Apologies for the three very similar photos - it's proably a bit unecessary! I forgot to take a photo of my coat as I thought I was running late. I wasn't, but, well, there you go. And apologies for the somewhat lacklustre blogging, lately - I feel like there isn't a whole lot in it for my readers, at the moment, but I'm hoping you'll all stick around whilst I navigate this rough blogging patch. Andi, you always look so wonderful! I bet they were ogling your awesome style, too, honey - how could anybody not?! I know what you mean about intentionally wearing something that's comfy enough to sit in for a couple of hours during a movie. 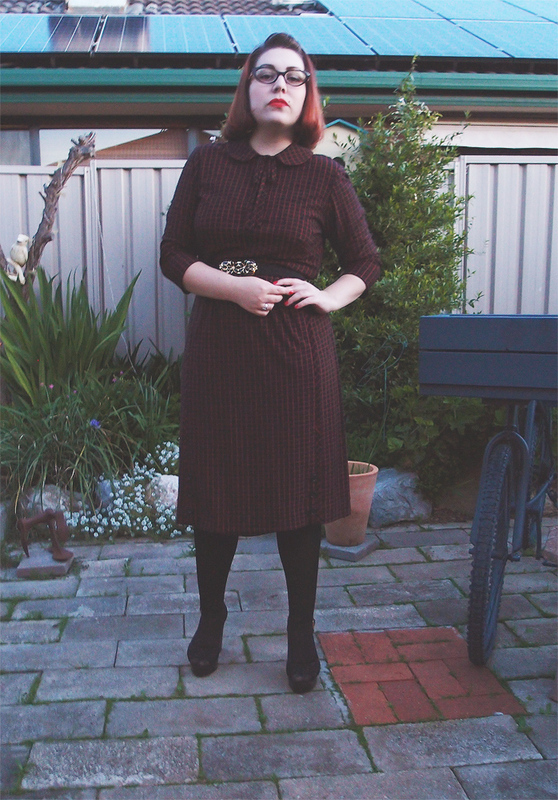 I have a great purple 70s does 40s jersey wrap dress that is my absolute go-to garment for just this setting (as well as flying in - pretty much any long haul of sitting :) ). I love the colour palette of this outfit and you. And the dusk. And do I spy MAC Lady Danger? Hee, thank-you! :D No, I'm wearing Besame lipstick but I don't remember which shade. Your shoes are wonderful! The platforms go with the dress really well. Much Ado About Nothing is one of the funest plays. I adore it and can't wait to see what Joss has done with it. Swit swoot, lady! LOVE every bit of this look on you!! *sigh* How do you always look so damn good?!?! I love that dress, and those shoes are killer. You look fab as usual! I love your outfit :) just discovered your blog, I'll definitely be back. Such a classy, elegant, gorgeous ensemble. I hope you had a wonderful time! Very cute dress. 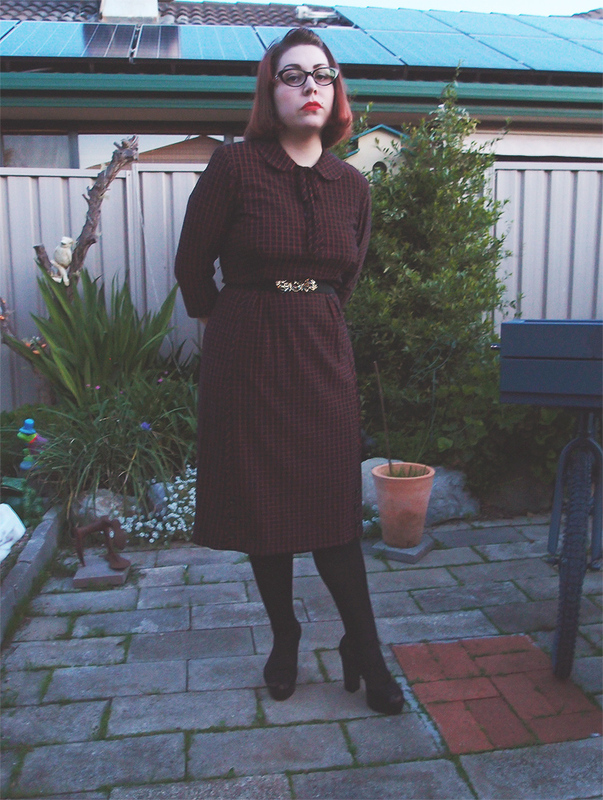 Love your vintage style.